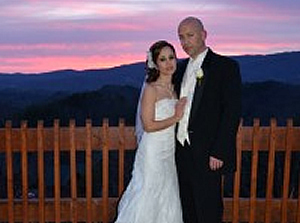 Our beautiful Pigeon Forge Wedding Chapel is surrounded by majestic mountains and is located in Black Bear Ridge Resort, nestled in the mountains only 5 minutes from the Parkway in exciting Pigeon Forge, Tennessee. We have it all for a stress free wedding: Ceremony, Minister, Music, Salon, Massage, Make Up, Cabins, Full Reception Hall, Photography, Video, Wedding cakes, Limo Services and featuring our Cinderella Ball Carriage. Your special day is a once in a lifetime event that calls for an equally powerful setting. We can accommodate a simple couple's only ceremony as well as an extravagant plush wedding with up to sixty-five guests. Our wedding coordinators will help you plan every aspect of your special occasion with various options for a unique backdrop depending on the season. 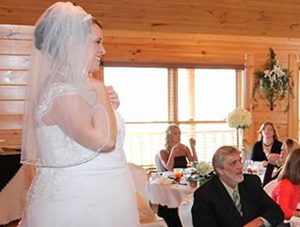 Our beautifully appointed Chapel and stone tower allows for some incredible memories captures by our professional photographers and is located within Black Bear Ridge Resort where you are your guests can enjoy the very best accommodations that Pigeon Forge has to offer.